MAS have been studying and surveying its Iconic Middleton Headquarters since 2013. This tour guide was published in 2015. The society carried out its first investigation of this site in August and September 2013. 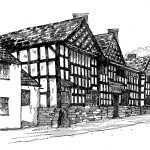 An early Church House may have been on site which became the Grapes Inn and then Church House Farm which was demolished in 1900. An open investigation in the summer of 2015 revealed the cellar of the Grapes Inn and a number of other features. In 2014 Middleton Archaeological Society was given permission by Hopwood College to clean up the remains of Hopwood Corn Mill. The society followed this in 2015 by excavating the footprint of the Millers Cottage just 50M downstream from the mill. Middleton Archaeological Society has been undertaking research into Tonge and Tonge Hall. What we have discovered this that there is a lack of information on the working underbelly of the site, the majority of work up to date has concentrated on the Hall building and the Tonge family. Just over 200 years ago in late September 1811, the poet, Lord Byron, stayed for a week at Hopwood Hall in Middleton. He called it ‘a pleasant country seat near Rochdale’. The owners and other guests were from English society’s ‘top drawer’ & connected to the royal court. The history of Middleton’s Bradshaw Hall and Estate at Middleton Junction has never been compiled. This brief history is therefore intended to summarise the written data and records available for Bradshaw from the 13th to the 20th century. It also includes references to the social history of the area in terms of modern urbanisation and industrialisation. It is assumed that a Roman road travelled from Manchester to the fort at Ilkey, Yorkshire; a direct alignment drawn between these two locations would pass just west of Middleton town centre and close to Tandle Hill before heading towards Milnrow, Littleborough and Blackstone Edge and across the Pennines.